The performance of all air-breathing engines is highly dependant on intake air conditions. Engine testing and calibration that ignores intake air conditions will be biased by the ambient conditions of that particular day of testing. This is most evident with on-the-road testing where ambient conditions cannot be controlled and are most extreme. As a result, the test results or calibration will have a random effect due to weather, and suboptimal emissions and fuel economy may result. As emissions and fuel economy regulations get more severe, this randomness in test and calibration quality cannot be tolerated. 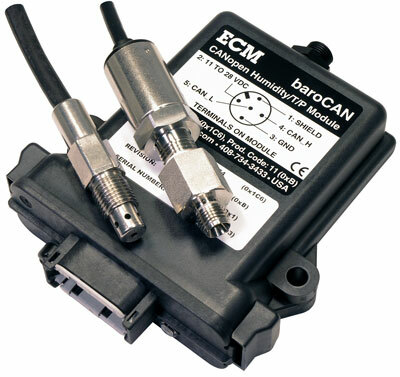 ECM's baroCAN module is a compact and rugged measurement system that provides all the important air conditions: humidity, %O2, dew point, water vapor pressure, temperature, and absolute pressure. These parameters are available in all known units via CAN communication. By including these parameters in the test data set, correction of the test data and modification of the calibration can be performed resulting in better optimized engine operation. baroCAN's sensors can be easily mounted in a variety of locations and contain calibration memory chips. 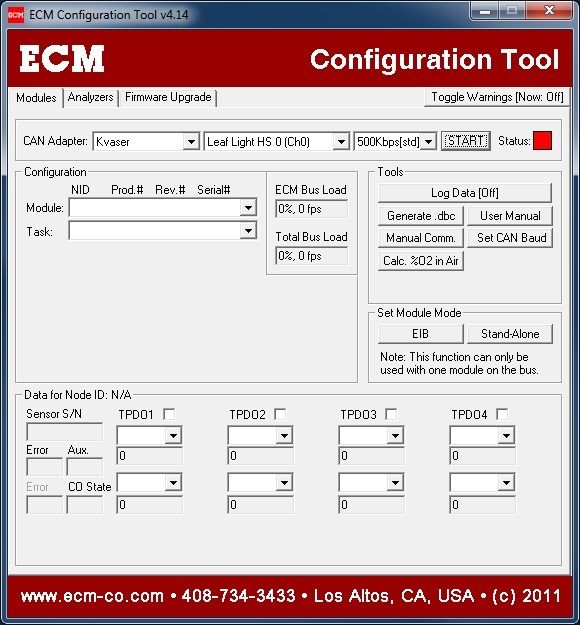 PC software to set-up CAN communication, view and log data, and calibrate the sensors is included. Two optional displays, one with programmable analog outputs, are available. These displays can be used with one or two modules. Although primarily intended for intake air use, baroCAN can be used for ambient air and cabin air applications in single and multi-module arrangements.